David Schendel and his 5 crew members shot film between October 31 and November 3 for our documentary Profiles in Courage and Compassion. Filming took place at four locations: the JACL Hall, the Buddhist Temple, Ricketts Lab on Cannery Row, and the Tor House in Carmel. 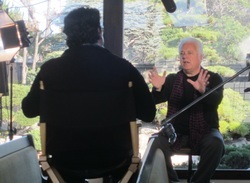 On November 4, Schendel’s crew traveled to film an interview at Ed Ricketts, Jr.’s Mill Valley home. 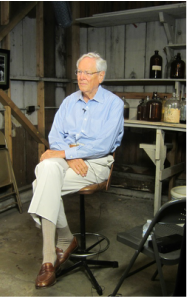 With one more important interview remaining with descendants of a cannery worker in the 1940s, we will have completed fifteen interviews. Schendel will then be ready with film in the can to move on to the editing phase. So we are getting closer to our timetable targets: first cut in May of 2017 and premiere showing in September. The Crew. 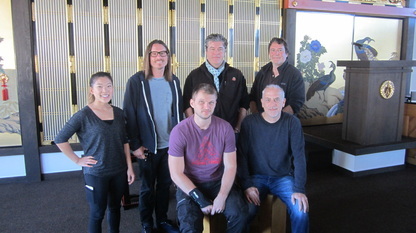 L-R: Sitting, Ilya Chegodar, 1st assistant camera; Greg Sumner, producer; Standing: Sarah Chang, production assistant; John Honore, director of photography; David Schendel, director & producer, Bill Roden, gaffer. 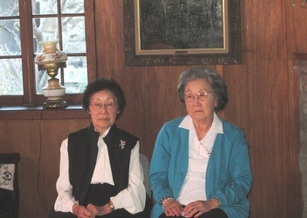 Left-to-right: Hiro Manaka and Toshiko Uyeda, reflecting on their return to Monterey after 1945 from the Internment camps. 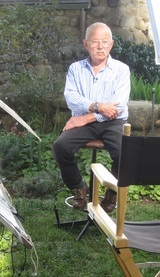 Photo taken at Tor House in Carmel. Geoffrey Dunn, historian, providing context and insights about public opinion favoring and opposing the return of Japanese Americans for resettlement after WWII to the Monterey Peninsula. Photo taken at the Buddhist Temple in Seaside. John Hudson's mother, Margaret Allan Hudson signed the 1945 petition. His grandfather, A.M. Allan, was partners with Gennosuke Kodani in their enterprise, the Point Lobos Canning Company, located at Whalers Cove. Here John comments on why his mother supported the petition drive and his memories of the Kodani family. Photo taken in the Tor House garden. Francis "Skip" Lloyd, a descendant and retired attorney living in Carmel, comments on how war can influence public mood. Skip also offered thoughts about why his father, Francis L. Lloyd, was inclined to sign the petition. Photo taken at Ricketts Lab on Cannery Row.